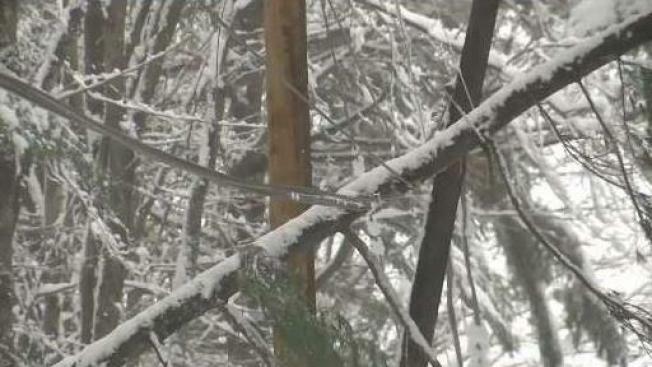 Thousands of Vermont power customers are still without electricity after heavy snow knocked down trees and powerlines on Tuesday. Thousands of Vermont power customers were still in the dark Thursday night, and some may not have service restored until the weekend, utility Green Mountain Power said. The situation follows Tuesday’s snow storm, which was troublesome because of the density of the snow. It weighed down trees, and as limbs and trees continued snapping and falling throughout Wednesday, new outages were happening even as fixes were being made. “Lots of trees down,” said lineman Denis Giroux, who is in Vermont from Quebec as part of a tripling of the field force for Green Mountain Power. GMP covers three-fourths of Vermont. The power company said more than 100,000 customers lost service this week because of snow the density of oatmeal. It was wet and gluey, and stuck to trees—sending them crashing into lines left and right. The central and southern sections of Vermont were hardest-hit, GMP said. “Day one of the event, we barely got to get to any customers because we were so busy clearing roads and just making roads accessible to crews,” said Mary Powell, the CEO of Green Mountain Power. When those workers reach trouble spots, they’re often finding them deep in the woods, inaccessible by traditional line trucks, where complicated fixes may only turn on a few homes at a time. Still, GMP said Thursday it is making really good progress, with around 90 percent of the outages fixed. For some customers, though, repairs could take until Saturday, GMP warned. In the meantime, Stockwell’s Garage in Braintree is relying on back-up power. Owner Kip Stockwell said while his generator is not enough to operate the hydraulic car lifts, it’s providing a way for customers to contact the mechanics to seek help with generators. GMP said it is opening its regional offices in Brattleboro, Springfield, Royalton, and Sunderland, to give customers a place to go for food, warmth, or to charge their cell phones and access WiFi. Some shelters have also opened up, both for overnight use and for warming during the day. “Cross your fingers we’re going to be home pretty soon,” said Giroux, the Canadian lineman assisting GMP. Green Mountain Power also said it’s watching another storm for this weekend, hoping it doesn’t mean more work for line crews.